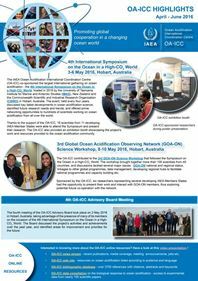 Requirements and Governance Plan, including expanding ocean acidification observations, closing human and technology capacity gaps, connecting scientists regionally and globally, and informing about the impacts of ocean acidification. The aim is to provide guidance that will allow for comparability across the Network, while considering the potentially different requirements and impediments of regions. GOA-ON seeks to increase capacity allowing for synthesis of data for common products. Can Virtual Reality be used as a tool to teach ocean acidification? Stanford Virtual Human Interaction Lab is looking for volunteers for a study on marine education and outreach. You are invited to participate in a research study on the challenges to teaching about ocean acidification in formal and informal education. You will first be asked some demographic questions. Then you will be prompted to describe the five most important challenges to teaching about ocean acidification. Time: Your participation will take approximately 10 to 15 minutes. • Seasonal variations in air-sea CO2 fluxes on the Great Barrier Reef reveal a strong CO2 release during the early-dry season. • The Great Barrier Reef is overall a net source of CO2. • CO2 fluxes are largely controlled by cross-shelf advection of oversaturated warm surface waters from the Coral Sea. The Great Barrier Reef (GBR) is the largest contiguous coral reef system in the world. Carbonate chemistry studies and flux quantification within the GBR have largely focused on reef calcification and dissolution, with relatively little work on shelf-scale CO2 dynamics. In this manuscript, we describe the shelf-scale seasonal variability in inorganic carbon and air-sea CO2 fluxes over the main seasons (wet summer, early dry and late dry seasons) in the GBR. Our large-scale dataset reveals that despite spatial-temporal variations, the GBR as a whole is a net source of CO2 to the atmosphere, with calculated air–sea fluxes varying between −6.19 and 12.17 mmol m−2 d−1 (average ± standard error: 1.44 ± 0.15 mmol m−2 d−1), with the strongest release of CO2 occurring during the wet season. The release of CO2 to the atmosphere is likely controlled by mixing of Coral Sea surface water, typically oversaturated in CO2, with the warm shelf waters of the GBR. This leads to oversaturation of the GBR system relative to the atmosphere and a consequent net CO2 release. The Permian Chert Event is of great significance to understanding the geological evolution of the entire Permian; however, the origin of widespread chert formation is debated. We report new geochemical data from deep-marine siliceous rocks of the upper Permian Da-long Formation, Lower Yangtze region, southeastern China. Their geochemical results show that these thin-bedded siliceous rocks have a clear biologic origin, with rare to no evidence of hydrothermal influence. The values of Al/(Al + Fe + Mn) and Eu/Eu* are 0.60–0.84 (mean = 0.72) and 0.45–1.08 (mean = 0.77), respectively, and Mn/Ti ratios are relatively low (mean = 0.72). The correlations of LaN/CeN, LaN/YbN, and Fe2O3/TiO2 with Al2O3/(Al2O3 + Fe2O3), along with the Ce anomaly, indicate that the Da-long siliceous rocks were deposited at a transitional zone between a continental margin and the open ocean; i.e., relatively close to terrestrial sediment input and far from hydrothermal activity. The accumulation of chert is related to its unique paleogeographic location in an equatorial setting with many submarine paleo-highlands. Intense upwelling and frequent local volcanism are the main factors that promoted the development of siliceous rocks in the studied area. Ocean acidification triggered by large-scale volcanism (Large Igneous Province) during the late Permian led to extensive silica precipitation and preservation. Carbonate-rich groundwater discharged from springs, seeps, and spring-fed rivers on carbonate platforms creates environments of potential refuge for calcifying organisms in coastal waters by supplying higher [Ca2+] and [CO32-] along with typically lower nutrient concentrations. The benefits associated with carbonate terrains are maximized in the presence of submerged aquatic vegetation (SAV), especially seagrasses. To improve the accuracy of carbonate saturation state (Ω) determinations, calculated values of [CO32-] and Ksp∗ were paired with [Ca2+] values determined using a model that incorporates directly measured riverine calcium end-members (model A). This model results in Ω values larger than those calculated by assuming that [Ca2+] is directly proportional to salinity (model B; e.g., using CO2SYS, CO2calc). As an example, for salinity (S) between 13.5 and 24, improvements in saturation states calculated as differences (ΔΩ) between model A and model B saturation states in the tidal mixing zone of the Weeki Wachee River (Florida, United States) ranged from 0.39 to 1.00 (aragonite) and 0.61–1.65 (calcite). Saturation state ratios (Ω(A)/Ω(B)) for coastal waters with enhanced [Ca2+] originating from carbonate-rich groundwater can be calculated from end-member calcium concentrations and salinity. Applied to several river systems in the conterminous United States, Ω(A)/Ω(B) values calculated at S = 20 lead to Ω(A)/Ω(B) ratios of 1.12 (Weeki Wachee), 1.09 (Anclote), 1.06 (Mississippi), and 1.03 (Columbia). These increases in saturation states can be used to identify potential calcification refugia for subsequent high resolution field studies that focus on, for example, the long-term viability of oyster communities and other calcifying organisms in brackish coastal waters. Research on the effects of climate change in the marine environment continues to accelerate, yet we know little about the effects of multiple climate drivers in more complex, ecologically relevant settings – especially in sub-tropical and tropical systems. In marine ecosystems, climate change (warming and freshening from land run-off) will increase water column stratification which is favorable for toxin producing dinoflagellates. This can increase the prevalence of toxic microalgal species, leading to bioaccumulation of toxins by filter feeders, such as bivalves, with resultant negative impacts on physiological performance. In this study we manipulated multiple climate drivers (warming, freshening, and acidification), and the availability of toxic microalgae, to determine their impact on the physiological health, and toxin load of the tropical filter-feeding clam, Meretrix meretrix. Using a structural equation modeling (SEM) approach, we found that exposure to projected marine climates resulted in direct negative effects on metabolic and immunological function and, that these effects were often more pronounced in clams exposed to multiple, rather than single climate drivers. Furthermore, our study showed that these physiological responses were modified by indirect effects mediated through the food chain. Specifically, we found that when bivalves were fed with a toxin-producing dinoflagellate (Alexandrium minutum) the physiological responses, and toxin load changed differently and in a non-predictable way compared to clams exposed to projected marine climates only. Specifically, oxygen consumption data revealed that these clams did not respond physiologically to climate warming or the combined effects of warming, freshening and acidification. Our results highlight the importance of quantifying both direct and, indirect food chain effects of climate drivers on a key tropical food species, and have important implications for shellfish production and food safety in tropical regions. 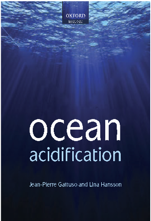 Increasing marine uptake of anthropogenic CO2 (Cant) causes global ocean acidification. To obtain a high‐resolution spatiotemporal distribution of oceanic carbon chemistry, we developed new parameterizations of the seawater total alkalinity (TA), and dissolved inorganic carbon (DIC) from the ocean’s surface to 2000 m depth by using dissolved oxygen (DO), water temperature (T), salinity (S), and pressure (P) data. Using the values of TA and DIC predicted by DO, T, S, and P data derived from autonomous biogeochemical Argo floats (BGC‐Argo), we described the distribution of oceanic Cant in the 2000s in the subarctic North Pacific at high spatiotemporal resolution. The Cant was found about 300 m deeper than during the 1990s; its average inventory to 2000 m was 24.8 ± 10.2 mol m–2, about 20% higher than the 1990s average. Future application of parameterizations to global BGC‐Argo data should allow the detailed global mapping of spatiotemporal distributions of CO2 parameters.